Step By Step How to Change your Blog Wordpress To Blogger ??? How to Change your Blog Wordpress To Blogger...??? Now, this is quite common to move from different platforms. You may want to move to Blogger because all the libertiesit provide as compared to Wordpress.com. Also if you are hosting your Wordpress blog on your server, you may want to move to Blogger due to all the FREE bandwidth and diskspace it provides. 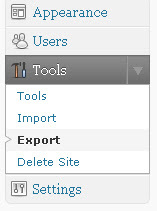 Create an export file of your wordpress blog. If your blog is quite big I would suggest downloading the file separately for each month. All you have to do download the posts and pages separately rather than as 'All Content', don't worry each post will carry its details and comments with it. You have to upload your wordpress xml file there and it will convert it to Blogger format and you can download it then. But there is a limit of size of 1 mb. That's why I suggested to download your posts separately and select dates such that each file is less than 1 mb. Now that you have a Blogger compatible version of your Wordpress blo, all you have to do is import it to Blogger. I suggest to uncheck the 'Automatically Publish all Imported Post' so that you can review them before publishing. Repeat the Steps 2 and 3 until you have imported all your Wordpress export files to Blogger. And after that you are done, go publish it on Blogger.